Fluid animation practitioners face great challenges from the complexity of flow dynamics and the high cost of numerical simulation. A major hindrance is the uncertainty of fluid behavior after simulation resolution increases and extra turbulent effects are added. 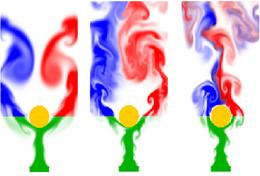 In this paper, we propose to regulate fluid animations with predesigned flow patterns. Animators can design their desired fluid behavior with fast, low-cost simulations. Flow patterns are then extracted from the results by the Lagrangian Coherent Structure (LCS) that represents major flow skeleton. Therefore, the final high-quality animation is confined towards the designed behavior by applying the patterns to drive high-resolution and turbulent simulations. The pattern regulation is easily computed and achieves controllable variance in the output. The method makes it easy to design special fluid effects, which increases the usability and scalability of various advanced fluid modeling technologies.